Prophet T.B. Joshua gave an enlightening sermon dealing with an essential subject for all Christians who are earnestly seeking for spiritual growth. 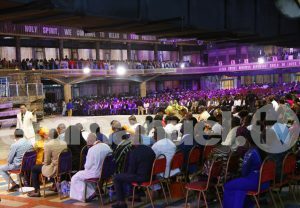 The message, titled ‘Building God’s Character’ revealed the necessary steps for people to take in order to overcome fear. After the thought-provoking message, Prophet T.B. 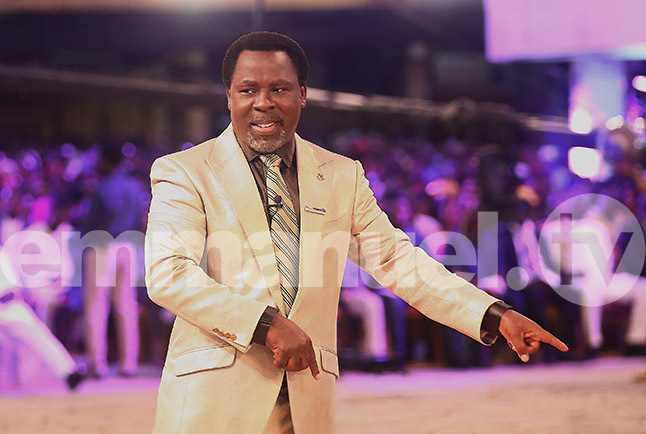 Joshua delved into the practical side of Christianity as he ministered healing, deliverance and prophecy to countless thousands who came from across the world to The SCOAN. The service ended with an action-packed time of Mass Prayer where Prophet T.B. Joshua led the congregation in prayer against the powers of darkness operating in their lives. The results were incredible – demons cast out and sickness forced out by the superior power of God! I CAN FINALLY SLEEP FREELY! Mrs Victoria Allenbuade, a Nigerian living in France, had been battling with the deadly affliction of sleep apnea for the past one year. According to her, her heart would stop functioning intermittently, reaching about twenty-eight times in just one hour at its worst! After incessant visits to hospitals, she was given a breathing machine as a life-time companion. It was a great distress for Mrs Allenbuade who applied all effort to get rid of this horrible situation, all to no avail. When she learnt about The SCOAN, she flew all the way from her base to receive a divine touch from God. Immediately after Prophet T.B. Joshua prayed for her in the power of the Holy Spirit, with a shout of joy, she declared that her nostrils that were formerly blocked had opened and she could breathe properly. 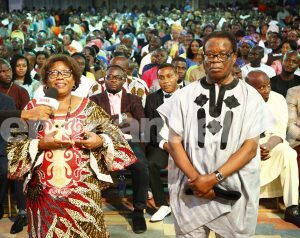 Standing before the congregants and viewers all over the world during The SCOAN Live Sunday Service, she affirmed that ever since she was prayed for, God had granted her a perfect and complete healing as she no longer has to use the breathing machine to sleep at night. She testified that she has been sleeping soundly without any fear – a fact equally attested to by her ecstatic husband! MEDICAL DOCTOR HEALED FROM AILMENT HE TREATED OTHERS FOR! In an ironic twist of fate, Dr. Frank Voadu, a medical doctor from Ghana, was struck down by the same affliction he often treated his patients for! He was suffering with the problem of lumbar spondylosis and disc inflammation, which impeded on every aspect of his professional and personal life. Even just to wear his socks in the morning became a daunting task due to the severity of the pain. He went to various hospitals for solution where pain-killing medications were prescribed to him – alongside a lumbar corset to support his weak spine – without any tangible improvement. Seeing his life spiraling down the drain of inability, Dr. Voadu and his wife began to desperately seek for God’s divine intervention. 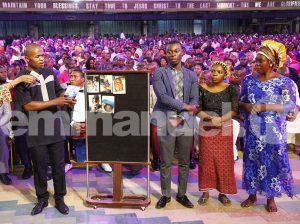 In their quest for a lasting solution, they discovered Emmanuel TV and decided to visit The SCOAN. During last week’s service, Dr Voadu encountered Jesus in the power of the Holy Ghost as Prophet T.B. Joshua prayed for him. In his words, “I felt as if chains were being loosed from my back!” Since that supernatural encounter, Dr Voadu has been walking and living in liberty – without any pain, distress or discomfort! He encouraged all to have faith in God as He alone is the answer to all fundamental issues of life. Indeed, doctors treat; God cures! Adding another pillow to her pile, Mrs Stella Onwuzurike sat upright on her bed, positioned the breathing machine over her face and nose and tried her best to fall asleep. Catching only moments of rest, she would be forced awake through either a fit of coughing or the smell of smoke in her nostrils. Struggling to stand, she would add water to the humidifier, adjust the tubing of the breathing machine and try once more to rest. This had been her uncomfortable routine for the past 25 years. Discovering Emmanuel TV while browsing on her tablet, she was shocked to see for herself the ministry she had been warned against and told was fake. Continuing to watch Emmanuel TV on YouTube, she developed faith that God would heal her of her dreaded disease. Coming to The SCOAN from the United States of America, she received prayer from Prophet T.B. Joshua. It was a touch of power, with power. At the touch of Jesus Christ, the root cause of sleep apnea was driven out of her system and the breath of God entered. She stood, breathing freely without the machine and one week later, testified that she has been sleeping normally without any artificial assistance and without any fear. Advising all to believe in Jesus for their healing, she testified that she has become a living witness, turning unbelievers to Christ through her testimony. “There is a huge woman with the spirit of man and woman” – these were the words of prophecy from Prophet T.B. Joshua that located Mrs Ruth Amah from Ghana and changed her story. In confirmation of the prophet’s words, Mrs Ruth said that the spirit of man within her manifested in her violence towards men, where she derived comfort in seeing blood flow as a result of the blows she dealt. The rage was so much that if she couldn’t find a man (or men) to beat up, she would vent her anger on a tree. A charm was inserted in her body to boost her violent spirit which landed her in prison many times. These violent attacks ended her first marriage and even led her to trace her former husband to where he was with another woman and beat them mercilessly. The spirit of woman also possessed her when she was introduced to a lady who slept with her. She subsequently began having other girlfriends – unknown to her second husband. When her first female lover died in a strange way, fear gripped Ruth that the same fate would befall her if she didn’t seek for deliverance. 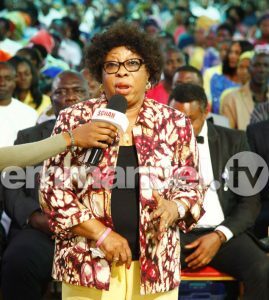 It was while watching another woman testify on Emmanuel TV of her deliverance from the spirit of woman that the conviction entered Mrs Ruth that she should turn to God for help. After the prophecy and deliverance last week, Mrs Ruth testified that the raging anger and affection for other women was now a thing of the past. Smiling with joy, she thanked God from the bottom of her heart for rescuing her life. 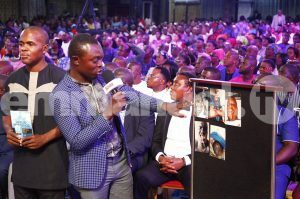 Mr Amah who was hearing much of the confession for the first time, displayed his shock and gratitude to God for delivering his wife, saying that his wife is now calm and peaceful. FROM DEATH TO LIFE: THE ‘SWEET’ MORNING WATER THAT BROUGHT ME OUT OF A COMA!!! Unknown assailants attacked with brutal ferocity, dumping his lifeless body by a dustbin and stealing his vehicle. As darkness enveloped, all Damian Idrahii recalls is a trance-like vision where his late father beckoned him to approach. However, Prophet T.B. Joshua then appeared and commanded him to return. Waking in a hospital, the events that precede this supernatural encounter are nothing short of miraculous. One of Damian’s close friends received the call anyone would dread to receive – his best friend was dead. Rushing to the hospital where a Good Samaritan had brought him, he saw his lifeless body – barbarically maimed and hacked – with blood oozing eerily from his head. Damian was in a coma but the damage done to his face was serious, requiring extensive, expensive surgery – if at all he managed to come out of the coma. Feverishly remembering the Morning Water from The SCOAN he had in his possession, he brought it out and ministered in Jesus’ name. Three days later, Damian suddenly awoke from the coma with the words: “It is sweet – put more!” As his friend ministered the Morning Water, he supernaturally returned from the land of death to the land of the living – evidenced by his remarkable dream. Even after waking from the coma, doctors still insisted he would need six months to recover and still required surgery. His friend kept faithfully ministering the Morning Water. Just six days later, Damian was discharged from hospital – in perfect health – a fact that shocked the medical professionals aware of the attack. To complete the incredible testimony, the stolen vehicle was recovered by the Nigerian police and returned to Damian! 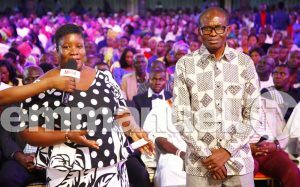 Sharing her testimony at The SCOAN, Mrs. Stella Chijioke told the congregation and viewers all over the world that she had been suffering from the spirit of the marine kingdom that had tormented her marriage and life. She recalled that she visited her father one day and questioned why her other siblings got married and shortly after giving birth ended up back to the family home and leaving the marriage. Mrs. Stella Chijioke soon found herself engulfed in the same trend as a broken home loomed large. Blessed with three beautiful children, the couple started to experience misunderstanding over trivial issues, leading to escalated quarrels that sometimes prompted Stella to threaten her husband with a knife. When their finances dwindled and there was difficulty renewing their rent contract, Mrs. Stella Chijioke threatened to walk out of the marriage and out of the lives of their three children. Regardless of her husband’s appeals, Stella packed out and moved to her parents’ house. Her mother was very delighted to welcome her daughter back home, telling her she was not actually interested in Stella being married to her husband. Her folks told her it was a good thing she left the marriage. Her family extended their support by encouraging her to prepare divorce papers to formally end the marriage, which she did. With his 10 years of marriage, Stella’s husband had to take over all household chores to look after their three children as a single parent. After having attempted on several occasions to leave the marriage, including the first day following the exchange of vows, as well as witnessing how her siblings were once married with children and were now living back with her parents, Stella finally decided she needed God to get out of her predicament. 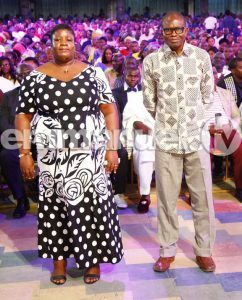 Eight months after walking out on her marriage, Stella visited The SCOAN where Prophet T.B. Joshua touched her and the demonic spirit operating inside her was arrested and manifested. 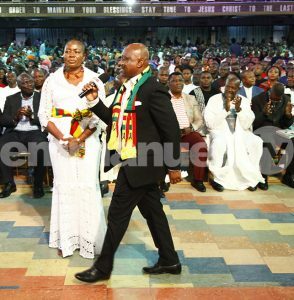 “I have destroyed her, I have destroyed her marriage, I have destroyed her business, we seized her finances – no business, I am from the marine kingdom…” blurted the demonic spirit that spoke through Mrs Stella Chijioke. Stella told the congregation and viewers all over the world that as soon as Prophet T.B. Joshua touched her, she felt fire all over her body and after that experience, she felt something left her body. Realising that she had been gone for 8 months out of husband and children’s life, her good feelings towards them returned and her heart yearned to be reunited with them. 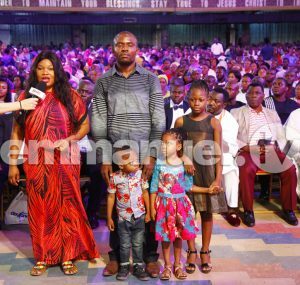 To the glory of God, she was reunited with both her husband and children at The SCOAN following her deliverance! Her husband told the congregation that he now sees a normal and very calm wife after the deliverance. The disrespect and harshness that once characterised his wife are no more, he told the congregation. 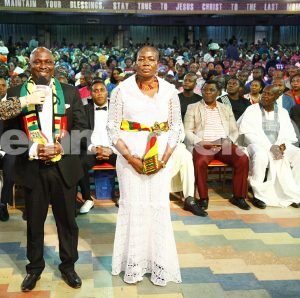 The couple advised the congregation and viewers all over the world to seek the face of God when they face similar situations because the root of everything is spiritual.